Daughter of Sir Edmund Gosse, the eminent man of letters, Sylvia Gosse trained at the St John's Wood School of Art, the Royal Academy Schools and under Sickert at the Westminster School of Art. 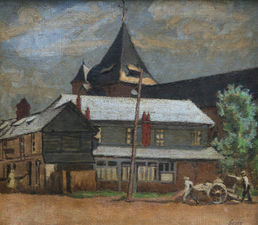 From 1909 she exhibited at Frank Rutter's Allied Artists' Association and began showing with the New English Art Club from 1911. In 1913 she exhibited with the Camden Town Group in their exhibition in Brighton. Her first solo exhibition at the Carfax Gallery in 1916 revealed the influences of both Sickert and Gilman. 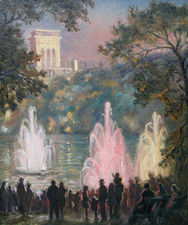 She was a founder member of the London Group and exhibited over fifty works with them throughout the 1910s and 20s. Remaining very close to Sickert, she taught with him at his Rowlandson House school in London and then followed him to Dieppe where she nursed him through periods of ill health. She was a loyal disciple of Sickert's methods in both painting and etching. In 1934 she instigated the Sickert Fund to support him in his old age. She was also close to Gilman for a period and modelled for him (see Sylvia Gosse, 1913, Southampton City Art Gallery). Admired by the critic Frank Rutter, she was included in his 1935 book Modern Masterpieces where she was recognised as 'belonging to the group of English Impressionists'. In 1989 a significant exhibition of her work was staged at the Michael Parkin Gallery and travelled to the University of Hull. Examples of her work are held by the Tate Gallery and Ashmolean Museum. She spent her final years living near Hastings in Sussex.